The choice to sit down and stay silent, or to stand up and speak. The choice to despair, or to hope; to wallow, or to act. I am here today to speak and I hope that you will join me. At 10:30pm on Tuesday, November 8th 2016, when it became clear to me that he-who-shall-not-be-named was to be our next President, I turned off the TV, crawled into bed, threw the covers over my head and thought about staying there for the next four years. Alas, the next morning my alarm went off as usual and there were kids to feed and a dog to walk and life to be lived. So I got up and started living. Over the next couple of weeks a strange thing happened. As I talked to my friends about the election and why the result was particularly devastating to me, I began to feel....hopeful. This was not what I expected. It happened because I started to speak about things which I had kept silent about for years, and it happened because as I spoke about these things, my female friends began to speak as well and in this sharing of our stories I found a kind of healing and more than a bit of hope. It started for me when I was seven years old. I was standing in the stationary aisle at our local five and dime (what we used to call a drug store) choosing a new pencil case to take with me to second grade. Would it be the denim one with the little pockets or the shiny red one that smelled like plastic and cherries? I wasn't sure, but I was enthralled with the chosing. I didn't know what this meant at the time, but I knew it wasn't nice and I immediately burst into tears and ran to find my mother, who was shopping in another part of the store with my little sister. When I found her, I grabbed onto her leg and held on for dear life, but I didn't tell her what had happened. I also didn't tell her when a boy grabbed my breasts while I was waiting in line to ride the roller coaster on a church youth group trip to an amusement park, or when my grandfather's best friend tried to look down my dress and then my grandparents forced me to give him a hug as he left. I didn't tell her about all the times I was groped and grabbed, flashed and fondled, propositioned and harassed over the next forty years from age seven to age thirty-three - in a car, at school, in a train station even at a wedding. Why not? Why didn't I tell her? Why didn't I SPEAK? As women (and girls) we are taught to be ashamed, we are taught that we are responsible, we are taught that keeping silent is easier for everyone. But it isn't. Not really. If anything, the election has hopefully taught us this. How must they feel, I thought, to have HIM held up as a leader, a role model, an example of what a man should be? But the more I talked to other women, the more I realized that we all have a list. A list of men like HIM who see our bodies as their birth right, to use and to abuse at will. And I realized that I was not devastated for them, but for all of us. For myself and for my sister and my mother, for my nieces and my friends, for my husband and my sons. And the more I realized this, the more I realized that we have the power to stop these men, if not from what they do then from getting away with it. Because we have the power to SPEAK, and to ACT and to HOPE. I hope you will join me. The above is the approximate text of a speech I gave at the Wallingford Toastmaster's Meeting on January 4th 2017. I say approximate because I didn't write the speech down before I gave it, only after, so this is one of many possible versions of the speech I actually gave. 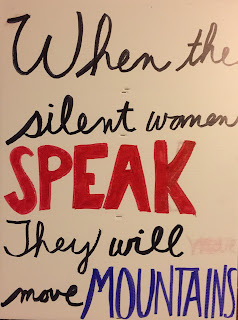 After I spoke another member passed me a scrap of paper with the following quote on it, “When sleeping women wake, they will move mountains.” I didn't know where it came from, but it touched me deeply. When I got home I looked up the quote and was at first disappointed when I realized that I had got it wrong, but as I thought more about it, I began to see the perfection in the mistake. For me, this version - my version - is more to the point. For years I had been silent about how men like our current President had treated my body, but I will be silent no more. 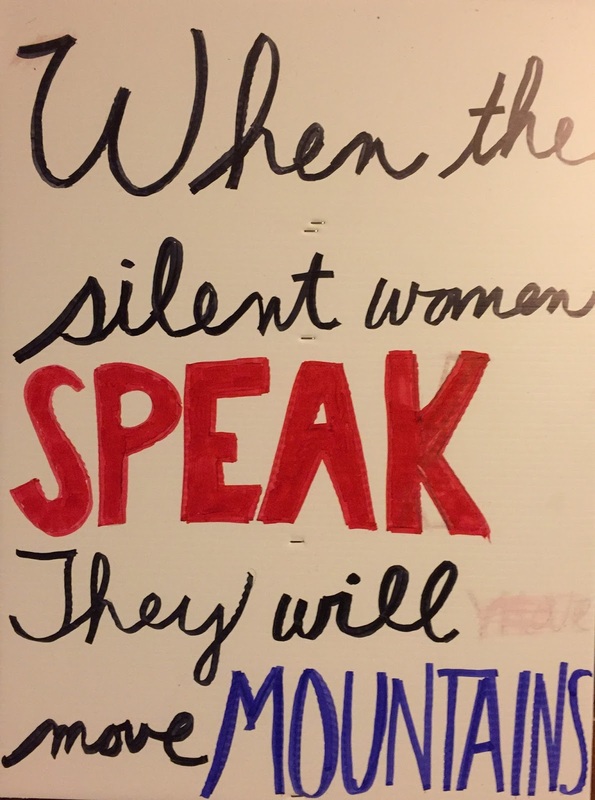 From now on I will SPEAK, and I will LISTEN, and together WE WILL MOVE MOUNTAINS. Today we are marching – and speaking - together. I hope you will join us. And if you don't join us, I hope you will at least support us.